TOUCH OF CREATION: Birthday Love!!! The stamp is from Art Impressions. Its a new released Ai people stamp. I used BIRTHDAY LOVE set for this card....love this image!! I colored my image with Copics.The patterned papers are from Echo Park. The Pink Elephant Monday Card Challenge - Anything goes. The Paper Girls - Anything Goes. There are so many cute & fun new Ai People stamps. Hilarious Piali! 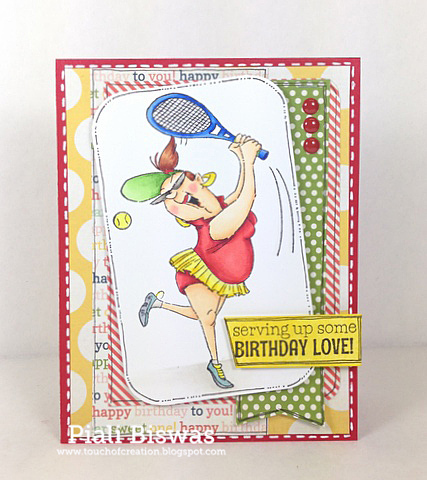 I play tennis, but I sure hope I don't look like that! lol! You brought her to life just beautifully with amazing coloring and layout! So cute Piali. I love AI images. I have an idea for using the stamp I won on your blog, just have not been able to play yet. CardMaker Magazine - Inchie Arts Blog Hop!! !